Rabbit fur has long been coveted, but around the 1700s people started to recognize that these little hoppers are so much more than their soft fur and began keeping them as pets. In many ways, they’re low-maintenance pets. For instance, rabbits have a simple diet and groom themselves. With that said, pet ownership always requires dedication and rabbits are no exception. If you’re thinking about get a rabbit you can share a thumping good time with then read on below! Rabbits are easy to feed because they mostly eat hay along with some leafy greens! They’re strict vegetarians so if you’d like to give them a treat consider bits of fresh fruits such as apples. Their inclination to chew can get them in trouble, though, because they might end up chewing on wires or other potentially hazardous items. They have to chew constantly to keep their teeth healthy so always ensure hay is available for them along with their water. Grooming is not a big concern for pet rabbits, who are more than capable of cleaning themselves. Still, frequent brushing will ensure your rabbit doesn’t deal with matted fur and will help limit the spread of their shed fur all around your home. Inspecting your rabbit for cleanliness is still recommended just in case they miss a spot and to keep parasites like fleas from going unnoticed! Just like cats and dogs, rabbits need plenty of play and interaction. They tend to be timid or shy, especially at first, but that doesn’t mean they don’t want to spend time with you. In fact, we encourage you to include them in the family by housing them in or near main living areas and not to confine your rabbit exclusively to their cage. Instead, get your rabbit friend out of their cage often and spend time together, even if you’re just watching TV together. Make sure to keep your rabbit’s cage in an area where they’ll feel included in the family as much as possible. You may not have been told just how active rabbits are, even if you know how much they love to chew. To keep your belongings intact and your bun-bun happy, purchase plenty of toys for them to enjoy. If your bunny starts chewing up the whole house, they’re likely under-stimulated and just need more activity. Having two rabbits may help prevent destructive behavior as well, while also creating a more natural environment for them. Wild rabbits live in communities, not in isolation! Keep in mind that rabbits do breed just as rapidly as you’ve heard, so any that you bring into your home should be spayed or neutered. So now you might be wondering about what to do about all the rabbit waste. It turns out, they’re easily trained to use litter boxes, just as cats do! Rabbits like to avoid open spaces, so find an accessible corner where you can keep the cage and accompanying litter box. Rabbits are also known to eat their own feces (certain kinds of it called cecotropes) for nutritional value so they’ll partially clean up after themselves and there’s no reason to be concerned. If you would like to get a pet rabbit look into options for adoption. 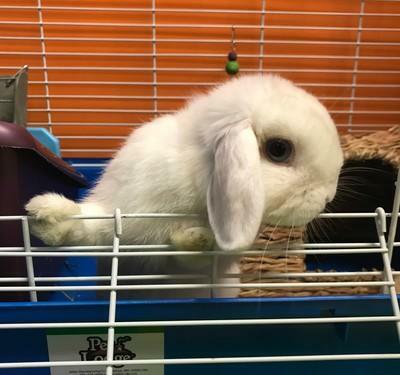 There are plenty of rescues that are looking to foster and adopt out rabbits. A word of caution: rabbits live up to a decade and even sometimes beyond. We encourage everyone to make this decision carefully and not to act on impulse, for example, and get a child a rabbit for Easter. It turns out they’re not as compatible with children as we may often think. Once you find the right rabbit companion(s), be sure to bring them in for an initial checkup and any medical care needed thereafter. We can even assist if your rabbit requires dental care or surgery! You can schedule with us by calling (703) 378-9791.